The Western Australian Premier says strong opposition to the state’s shark culling plan will not stop it going ahead, but it has made local fisherman hesitant to bid for tenders to help the killing. The WA Government has offered up a tender for professional fishers to rid certain areas of the WA coast of all white, bull and tiger sharks over three metres long. The Premier has suggested government workers such as fisheries department staff may be made to monitor the baited lines. 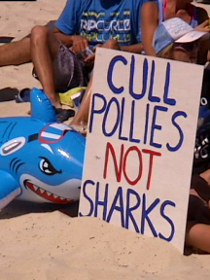 Many are opposed to the cull, which is a response to a small handful of tragic deaths in waters off WA. Reports say hundreds of sharks will be killed in the attempt to remove the ‘rogue’ individuals which some believe are behind the attacks. A strong international push for the cull not to continue has created unity among local activists, which have formed a super-group specifically to sabotage the plan. “We are looking to do whatever is required to put an end to this hunt,” Ross Weir, a spokesperson for the groups fighting the mass-killing. “Any applicants that will be applying for this tender and this contract need to take very careful consideration into account as to the potential backlash and direct action tactics they will face,” he said. It is not impossible that the added costs incurred from the opponents’ disruptions could end the project, with some reports saying funding is too thin to fully realise the plan as it is. ‘It's clear when the Government made the announcement they hadn't done the basics, they hadn't worked out the logistics and they hadn't done the finances,” says WA Opposition spokesperson Dave Kelly. The WA Government had hoped to have lines in the water by January 10, but now says it is looking to award the tender to place the floating hooks sometime this week.